Over Mothers Day weekend, I was looking for a quick appetizer idea. A quick bite before the steaks were put on the grill. 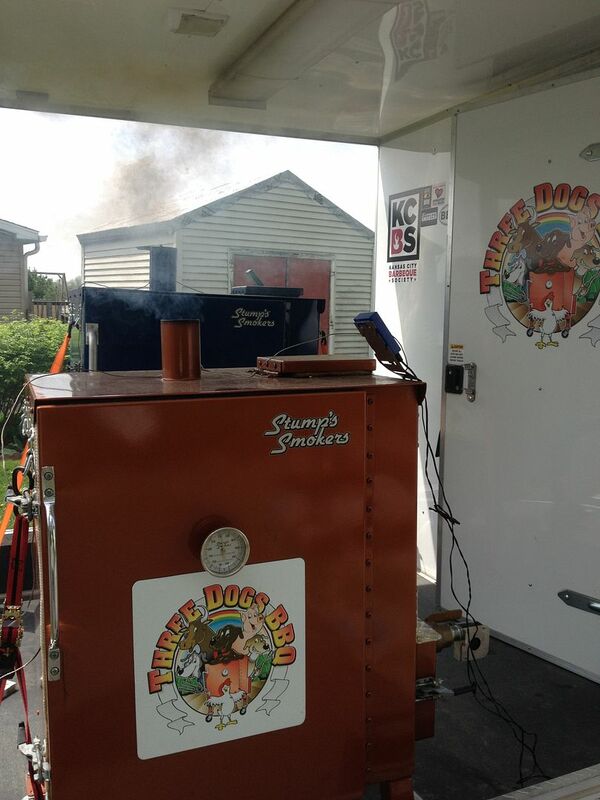 Preferably, it would be something I could throw on the smokers as I was burning out the built up gunk on the inside before our next competition. So, I took a quick inventory of the kitchen shelves for something quick, easy, and that would be good. Low and behold, look at what I found. 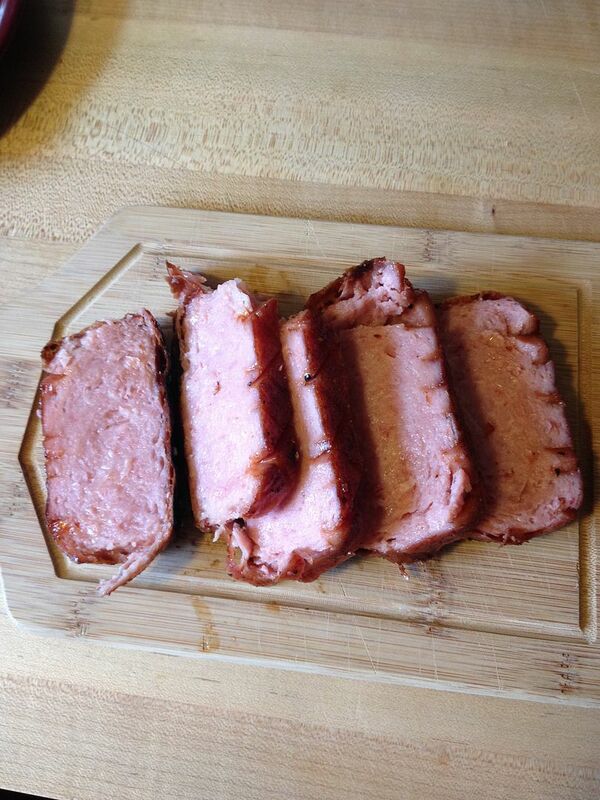 Spam, that mystical, mystery meat from our childhood. 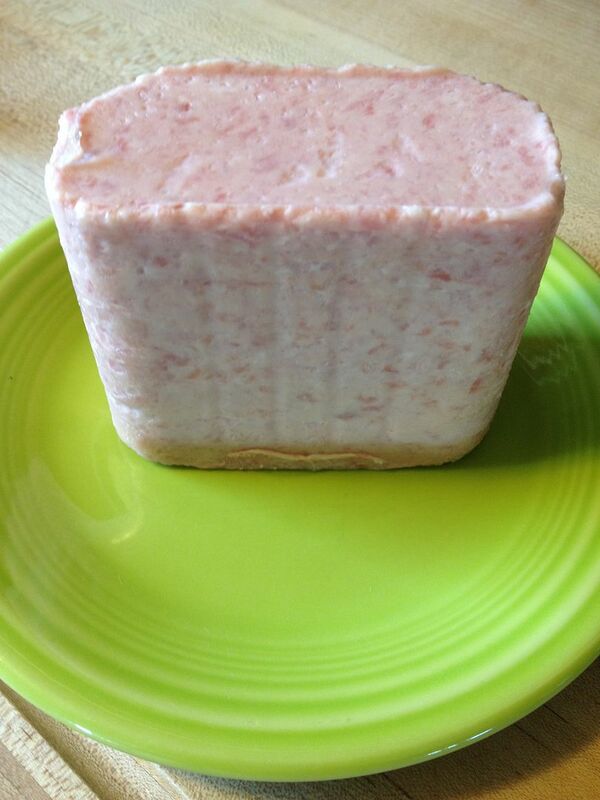 I had a lot of bologna and chipped ham sandwiches back in my childhood days, but occasionally Mom would slide in some Spam, or Spam's first cousin, Treat. 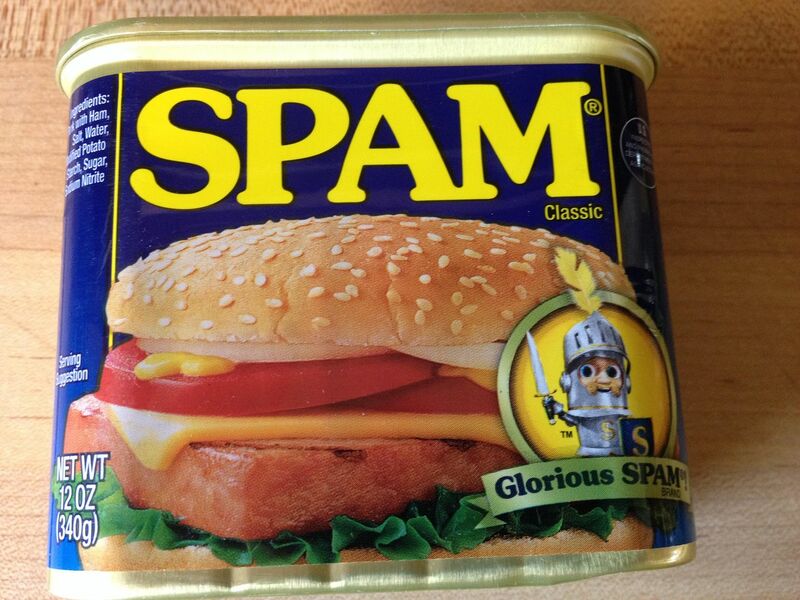 For those of you who do not know what Spam is, here is a quick summary of Spam. Basically, Spam is spiced, canned ham. I seem to remember the outside being encased in gel? Is this a kinder, gentler, lower fat Spam now?Anyway, some joke that Spam is made from leftovers from the pig after processing. Lips, hooves, everything but the oink. My Mom usually pan fried slices and served on squishy white bread with sliced onion, perhaps a tomato, American cheese, and mayonnaise. Others pan fry and serve with eggs. I decided to try and elevate this premium ham product and go the smoked route. So, I took the "fillet" of processed ham goodness and scored the top with crisscross knife slices. 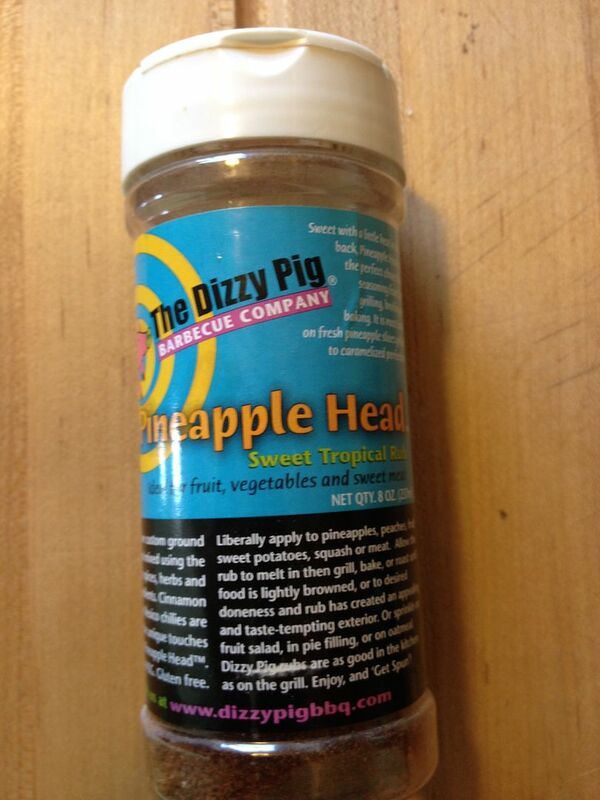 Then, for the rub, I dusted all sides of the Spam with a liberal coating of Dizzy Pig Pineapple Head rub. 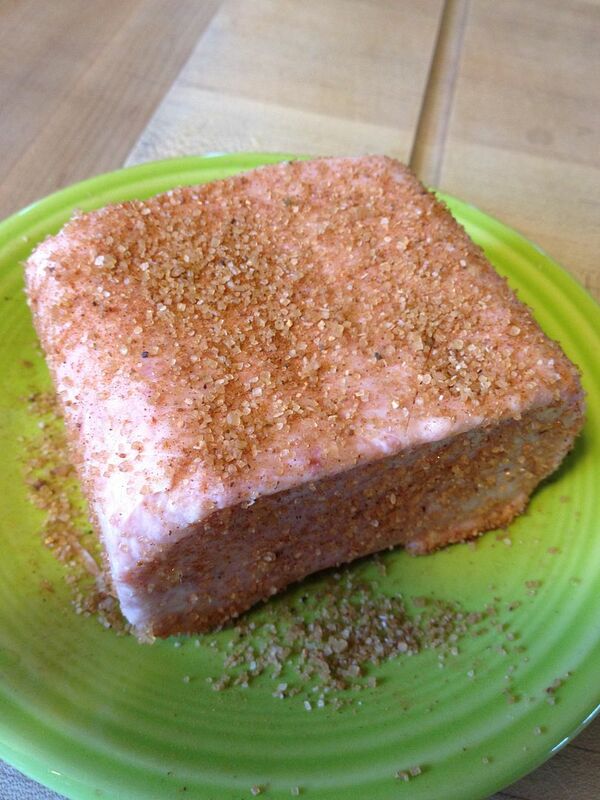 Hawaiians serve their Spam with grilled pineapple garnish, so why not a pineapple rub? 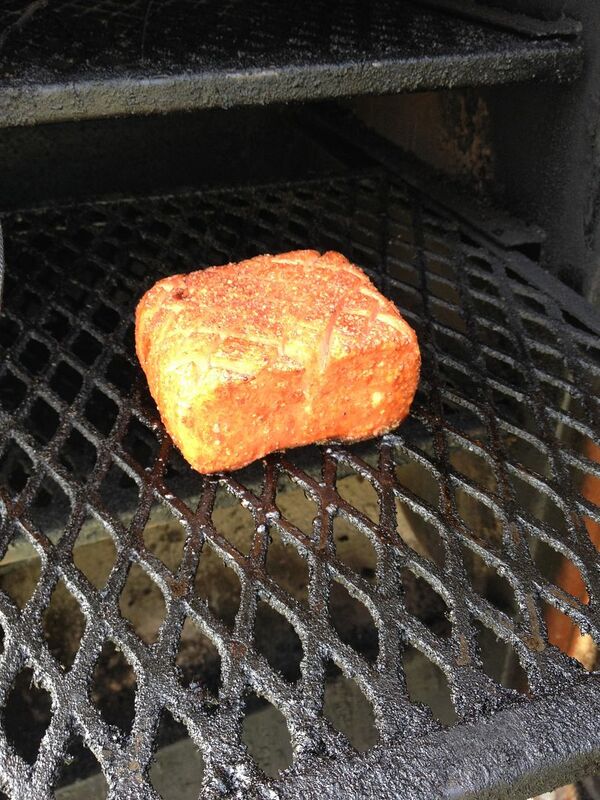 Then, I placed the Spam on the top rack of our smoker at 350 F with a piece of hickory wood in the ash pan for some smoke. 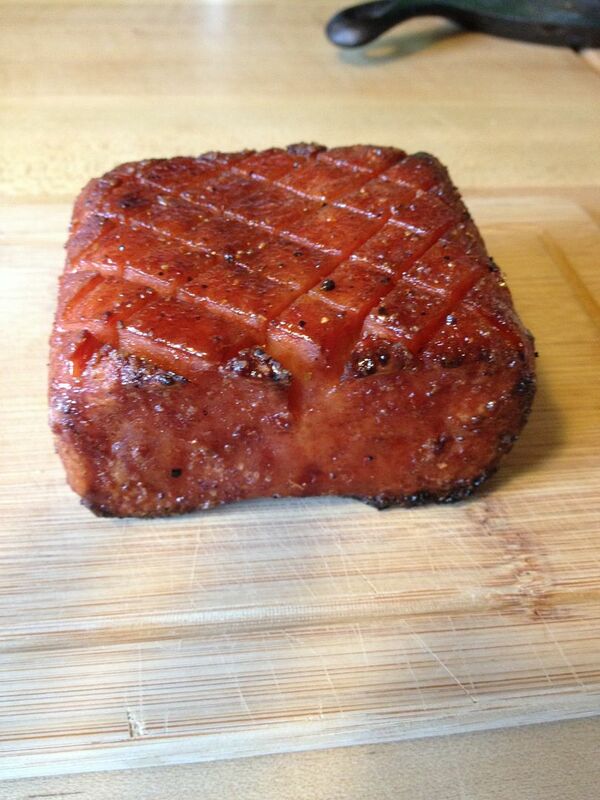 Thirty minutes later, the rub was forming a nice crust on the outside and the scored cuts were opening up, making this hunk of Spam look like a premium ham. 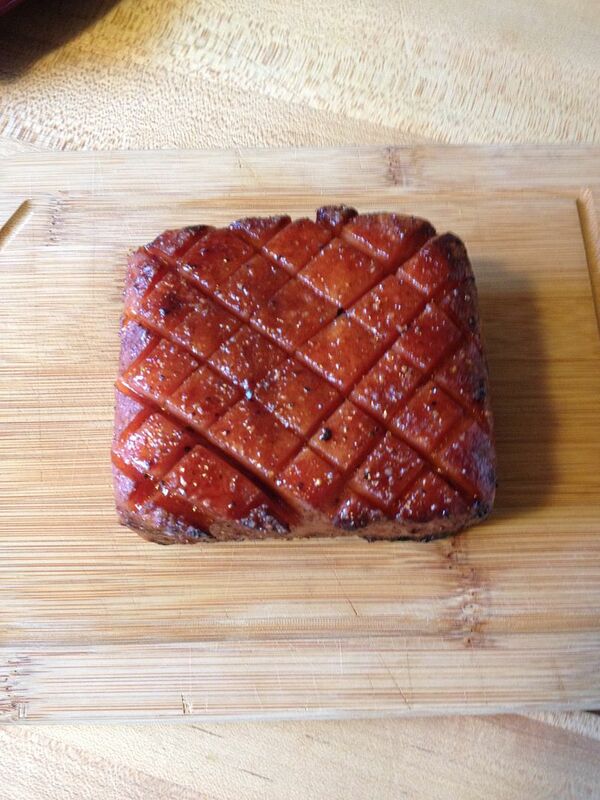 At this point, I squirted some Blues Hog Tennessee Red BBQ sauce on the top to glaze our Spam. 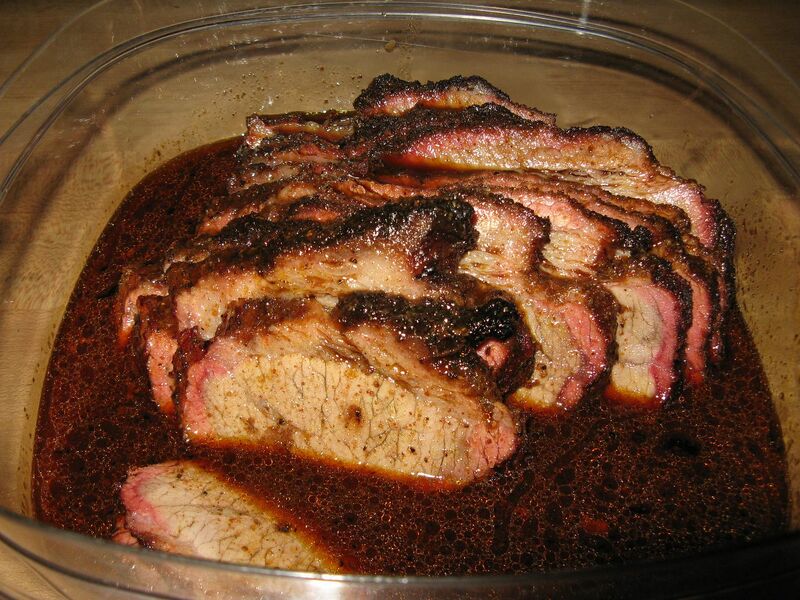 After adding the BBQ sauce, I let our appetizer cook for 15 more minutes to set the glaze. 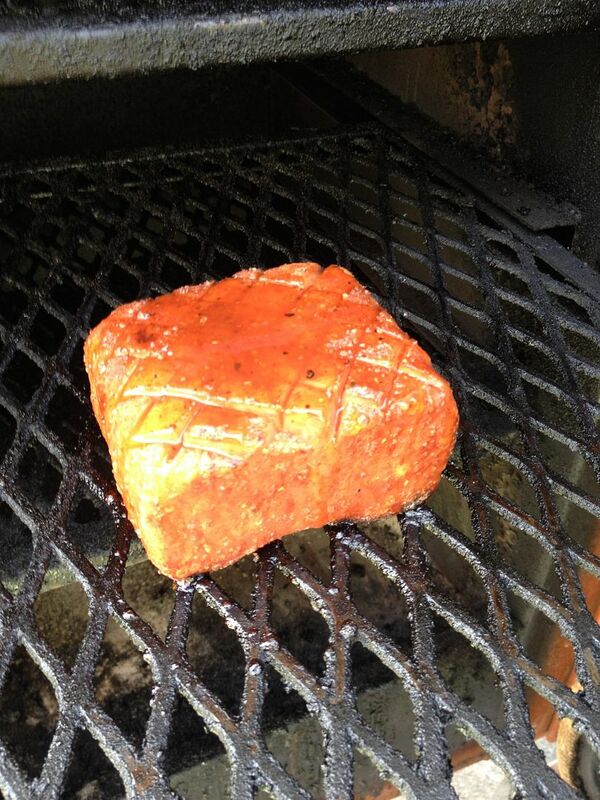 Then, removed from the smoker, and let it rest for 10 minutes before slicing. How was it? Surprisingly good. The heat added a nice crispy crust on the outside. 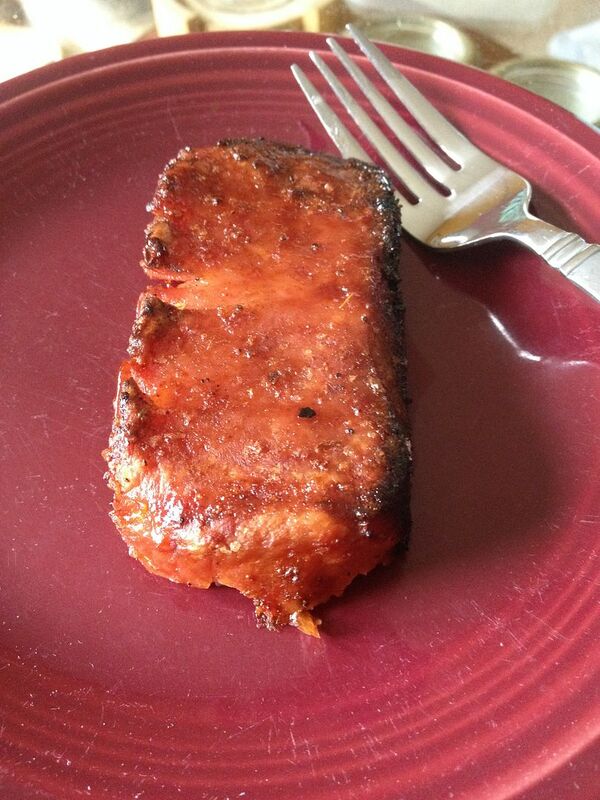 The pineapple rub and tangy BBQ sauce provided this piece of Spam with a nice acidity to counteract the fattiness of the Spam. One negative was that I forgot how salty Spam was. Overall though, it was good. This is not your Mothers Spam. Don't be afraid, don't turn up your nose. 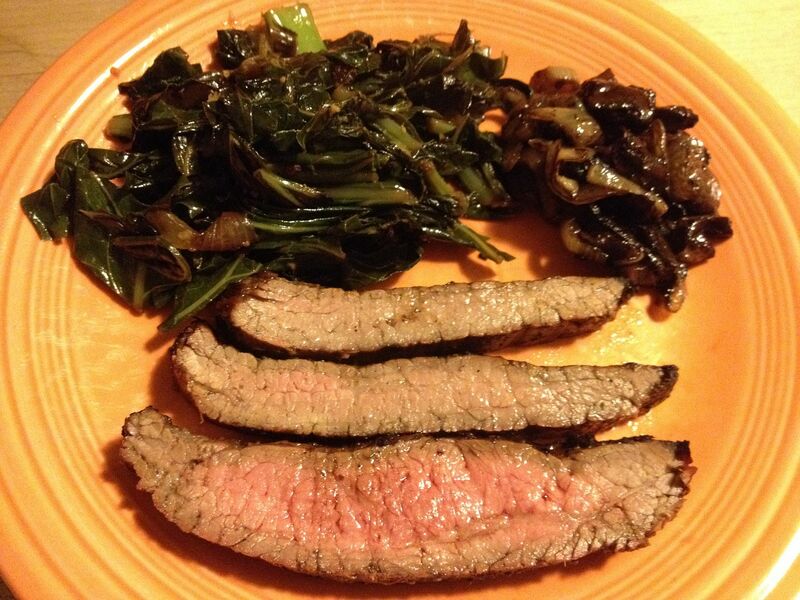 Embrace your childhood memories and give this recipe a try. That sounds reasonably tasty. I liked span as a kid. I also liked Underwood deviled ham. I have on the to do list smokng a bologna. Bologna is also on my list as well. Never tried the Underwood deviled ham. Do they even make that anymore? I have not seen it at the store in quite awhile. I wasn't so convinced at the beginning of your post but the final pictures actually look quite good! 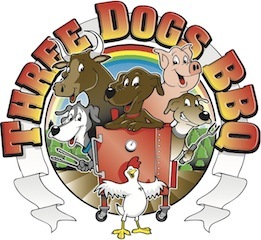 Gus, do you have something equivalent Down Under? Hey Bill it's Mac from the stumps forum. See ya sent me a message but the site is not working right for me. Let's me sign in and then it kicks me off so I haven't been able to read the forum for a while. I seen an email that I had a message from you. Nice job on the spam!!!! Thanks Bill! Wish I did better but you know how that goes!! Have they said what's up with the forum?? Seems like some guys can get on and most can't !! I like Spam and I like smoking meat. Looks dang good to me. I'll have to try smoking some !